The following papers provide some background on research into the evolution and ecology of Joshua trees. Joshua Tree Genome Project collaborators are bolded in the author listings. A combination of demographic studies and ecological modelling suggests that Joshua trees are already experiencing range contraction in Joshua Tree National Park. 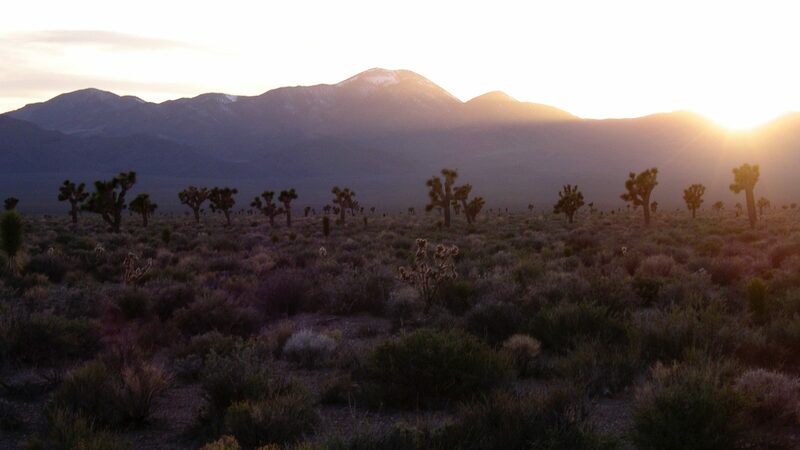 Modelling predicts that under plausible future climates, Joshua trees will be restricted to higher elevations within the Park. Demographic studies of contemporary populations indicate that young trees occupy only ~50% of the range of older trees, and the areas in which young trees are found are the same areas predicted to be suitable in the future. Considers the effects of both increasing temperature and increasing CO2 levels on the potential future distribution of Joshua tree under plausible climate change scenarios. The model predicts extinctions in many parts of the trees’ current range, but also suggest that greater freeze tolerance will allow range expansions in some areas. Describes the development of microsatellite markers for Joshua tree, which can be used to understand the genetic variation of tree populations, and the degree of genetic differentiation between them, without directly sequencing DNA. Measurements of Joshua trees from sites across the Mojave Desert demonstrate that tree populations served by one species of moth differ from populations served by the other moth. Trees in the western Mojave, associated with Tegeticula synthetica, have long trunks (growing at least one meter before branching), longer leaves, and flowers with long, tapering pistils. Trees in the eastern Mojave, associated with T. antithetica, begin branching close to the ground, have shorter leaves, and have flowers with stubby-looking pistils. The differences in the shape of the floral pistil, specifically the length of the stylar canal, are the most completely differentiated feature of all those measured. Species distribution models that describe the climates in which the two forms of Joshua tree are found reveal very similar conditions, particularly in the region where both forms of the tree come into close contact. This suggests that differences between the two forms of Joshua tree were not created adaptation to different climates. Measurement of moth ovipositors, the appendages used by female yucca moths to lay eggs in Joshua tree flowers, show that ovipositor length is correlated with the length of the stylar canal of tree’s flowers. Survey of Joshua tree flowering, fruiting success, and clonal reproduction with respect to pollinator moth abundance at different elevations in Joshua Tree National Park. Moth abundance is lowest, and fruit set is correspondingly low, at higher elevation where trees are less likely to be under climate-change threat. Reviews previous studies of morphological variation within Joshua trees, and differences in the pollinators occurring in different parts of the Mojave. Recommends recognition of two separate species. The bimodal karyotype of yuccas and agaves have long been a curiosity to taxonomists. The distinctive 25 small + 5 large haploid chromosome number of the taxa has often been used as a character to suggest that the genera are closely related. The origin of bimodal karyotypes has been thought to be derived from allopolyloid events. Gene trees derived from transcriptome sequences demonstrate that an polyploid event co-occurs with the origin of the bimodal karyotype in the history of yuccas, agave, and other closely related relatives like hostas. Though polyploidy was not demonstrated as the cause, it provides motivation to further investigate the genomes of these organisms. Official documentation that Joshua tree is pollinated by two distinct species of yucca moth. Tegeticula synthetica is found in the western Mojave, and T. antithetica in the eastern. Notes that the distribution of the two moths seems to correspond to different forms of Joshua tree, which have been formally described as separate botanical varieties by prior authors. Identifies single-nucleotide polymorphisms (SNPs) at which different variants are associated with shorter or longer floral styles and differences in vegetative strcture in “pure” populations of the two different forms of Joshua tree. These SNPs show signs of unusually strong differentiation within the Tikaboo Valley hybrid zone, consistent with natural selection against hybrids. Analysis of DNA sequence data from Joshua tree and its two pollinator species demonstrates that the two moth species became separate species more than one million years ago, while in some cases Joshua tree populations served by different moth species have similar genetics. At one population where both forms of Joshua tree and both pollinator species co-occur, sometimes within a few meters of each other, each pollinator species is more likely to be captured on its “native” form of the tree — though they do visit both types. Capturing pollinator larvae as they exit Joshua tree fruit, and using genetic data to identify which species they are, shows that even if T. synthetica sometimes visit the eastern form of Joshua tree, it does not successfully rear larvae in eastern flowers. Larvae of the other species, T. antithetica, do emerge from fruit of the “non-native” western-type tree, but female T. antithetica laying eggs on western trees have fewer surviving larvae than those laying eggs on eastern trees. The genetic markers developed by Flatz et al. (2011) reveal hybrids between the two forms of Joshua tree at the site where both forms co-occur. The genetic data are most consistent with a model in which pollinators move from eastern-type trees to hybrids or western-type trees more often than the reverse, which is congruent with the patterns of pollinator preferences and egg-laying seen by Smith et al. (2009). Genetic data for Joshua trees in sites across the Mojave Desert confirms detectable, but weak, genetic differentiation between the two forms of Joshua tree. Even after controlling for the effects of physical distance between populations (“isolation by distance”), differentiation between populations of the two tree types is best explained by their association with different pollinators.